More of these policies were passed in 2016 than in any previous year—a total of 222 new policies. Not only that, this year’s policies were the strongest ever passed. The median policy score this year was 80.8, up from 68.4 last year. A record 51 policies scored a 90 or higher, including three policies that scored a perfect 100. 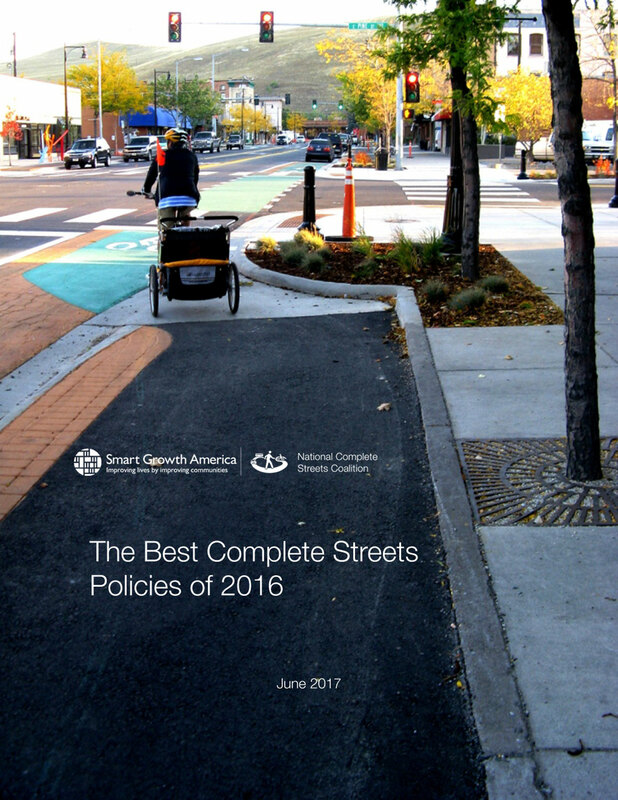 The Best Complete Streets Policies of 2016, released today by the National Complete Streets Coalition, celebrates all of these accomplishments as well as the communities that passed the strongest Complete Streets policies in 2016. Congratulations to these standard-bearers for passing the strongest policies in the nation in 2016. To discuss all these findings and how communities everywhere can craft and implement strong Complete Streets policies, join us for a free webinar today, June 8, 2017 at 12 p.m. EDT. Joining us for the event will be representatives from the City of Missoula, MT, one of the three communities that passed a top-scoring policy this year, as well as representatives from Warsaw, MO and Richton Park, IL, two of the most diverse communities on this year’s list. Join the event to hear the reasons why each of these communities chose a Complete Streets approach, and how they are putting it in to action. Congratulations again to all the communities that passed Complete Streets policies in 2016! We look forward to working with you to put these policies in to action, and with new communities on Complete Streets policies in years to come.